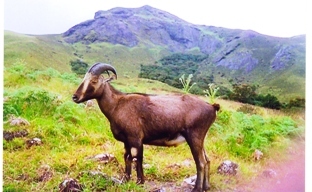 The Mukkurthi Wildlife Sanctuary is located on the high altitude of the Nilgiri Hills, 40 kms away from Udagamandalam (Ooty). It forms a part of Nilgiri Biosphere reserves, and is interspersed with sholas and woodland. Some of the animals found here are Sambar, Barking deer, Nilgiri Tahr, Nilgiri marten, Otter, Jungle cat, Jackal, etc. Some of the avian species found here are hillbirds viz. Laughing and whistling thrushes, woodcock, wild pigeon, black eagle, Butterflies with Himalayan affinity like the Blue Admiral, Indian Red Admiral, Indian Fritillary, Indian Cabbage white, Hedge blues etc. Many trekking routes are there from the Parson valley and the Pykara valley. Fishing enthusiastics can enjoy trout fishing in the rivers and lakes of Mukkurthi, with the permission of Assistant Director, Fishery Department. By Air: The nearest Airport is at Coimbatore, 140 kms. away. By Rail: Udagamandalam (Ooty) is the nearest railway station. By Road: Mukkurthi is connected to Udagamandalam by road.